Adding the necessary services to the customer, so that they can be activated. Activating the services, so that they can be used. Activating the floor & switch port, so that the handset can get service. Navigate to the Client tab and then choose the relevant client from the list. Choose Service > Manage Services. If the client already has some products which supply a phone service, you can increase or decrease the quantity by clicking the + or - sign next to the product, and then clicking Save. If the client does not already have any products which supply a phone service, you can add by clicking on New Services, choosing Bundles & Misc or Voice, then click the + sign next to the product you wish to sell and then Add Services. Navigate to Clients, choose the relevant client and then click Telephone Manager. If this is the first telephone service then a number will have automatically been activated for you – you will be able to identify this from the Status column. You can further enhance the number by linking it to a user, which will pull the first and last name of that user across. Or you can highlight the number, click edit and adjust these details yourself. If this is a new or additional package then you will need to activate the number. You can do this by highlighting the Reserved number that you would like to activate and then Edit. Toggle Enable ON, also check the device type is set to Polycom_Flex and click Save. 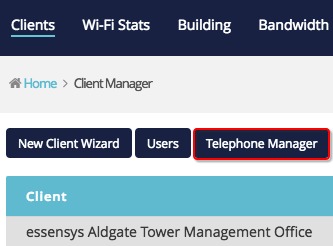 Back on the main Telephone Manager page, take note of the Extension and the PIN as you will need these to log into the telephone handset. Confirm which floor port the client will be plugging the telephone handset into. In Building, choose the room that the client is located in, and then Floor Ports. Check the Status of the floor port that you would like to use. If it’s Patched to Switch then take a note of the information in the Switchport (Switch) column. If it’s Unpatched then you will need to patch it. To patch, choose the floor port and then Edit. On the next page, change the Port Status field to Patched to Switch and then choose a switch port from the Switch port (Switch) dropdown. Take note of the port that you choose, and then Save. If the port was already Patched to Switch and you’re confident that your patching list for the room is up to date then there is no need to go to the comms room, and you should move on to the next step. If the port was Un-patched or you’re concerned that your patching list for the room is not 100%, you should go to your comms room to patch / check patching. In the comms room, ensure that the patch panel number corresponding to the floor port you would like to use is connected to the switch port that you noted in the step before. If you need further assistance in the comms room then you may find this article helpful. On Switches, choose from the Please select a switch dropdown the switch that your floor port is connected to. Next, choose the port by clicking on it, and then click Edit Port. On the next page, choose Voice, LAN, Internet from the Role dropdown, choose the relevant client from the Client dropdown, and then Save. If not already done, connect one end of the curly cord to the bottom of the receiver, and the other to the phone port on the back of the handset. If not already done, slot the stand into the back of the handset. There are 3 slots, to allow for different positions. Connect the cable that comes with the handset into the port with the network symbol on the back of the handset. Connect the other end of this cable into the floor port. Power comes from the switch, via the floor port. If you would like to provide a PC with internet connectivity then you can connect a cable from this to the port with the computer symbol on the back of the handset.